Les Trois Etages for London. This May, Dom Pérignon will open its London doors for guests to discover the three “windows of expression,” of Dom Pérignon Champagne. Les 3 Étages by Dom Pérignon’ will be staged in a traditional town house in a secret central London location. Set over three floors, each will express the different levels of maturity, the so-called ‘Plénitudes’, of Dom Pérignon with a series of opulent parties, dinners and creative collaborations. Chef Skye Gyngell has partnered with Dom Pérignon to oversee the restaurant and created a unique menu to complement and enhance the three Plénitudes of Champagne: the paired tasting menu reflects Skye’s signature style and features light Summer dishes, created using fresh, locally sourced seasonal ingredients.” The pop-up promises “a playful space that will celebrate the finest gourmet creations alongside the most exceptional vintages of wine.” Les 3 Étages by Dom Pérignon will be open to the public on Saturday 9th and Sunday 10th May 2015. Tickets are priced at £95 for a morning tasting, £200 for a lunch and £250 for dinner. Further information and tickets available from uk.domperignon.com. For the first time ever, Dom Pérignon is also opening the doors of the Abbey of Hautvillers to the general public. A series of ‘Ateliers’ will take place in June, July and October 2015 where paying guests can “immerse themselves in the universe and heritage of Dom Pérignon.” Guests will learn about the Champagne region and its winemaking process in general, as well as the specifics of Dom Pérignon. Chef de Cave Richard Geoffroy believes that Dom Pérignon matures in cycles and reaches its first peak of maturity, or ‘Plénitude’, after at least seven years’ ageing on the lees. The second Plénitude occurs after a minimum of 12 years’ lees maturation, and the third requires no less than 20 years. The Atelier experience will offer an opportunity to taste the three Plénitudes and the price per person for the one day Atelier experience is 600 Euros. Information and bookings: +33 3 26 51 33 39 or atelierdomperignon@domperignon.com. 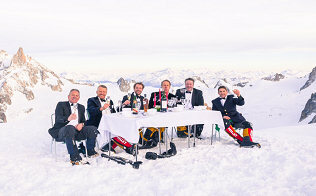 Adrian Bridge, CEO of The Fladgate Partnership (Taylor’s, Fonseca and Croft Ports), joined seven British adventurers and mountaineers last week to begin their attempt at staging the highest formal dinner party in the world on Mount Everest for an entry in the Guinness World Records. The expedition to the North Col of Mount Everest departed on 11 April and aims to reach an altitude of 7,000 metres, where the formal dinner will take place on, or around, 27 April. Led by Neil Laughton, a former Royal Commando and SAS Officer, the party also includes 2 Star Michelin chef, Sat Bains, who will cook dinner. On top of their climbing equipment, members of the expedition will carry chairs, tables, cutlery, crockery, glasses, candles and a flower arrangement. They will change into black tie before sitting down to a formal dinner and Bridge will produce a rare sixty two year old bottle of Tawny Port to share with his fellow mountaineers. All proceeds raised from the Everest dinner party challenge will go to Community Action Nepal, a UK based charity which supports the mountain people of Nepal. See justgiving.com/everestdinner. Australia’s abc.net has reported the story that a researcher at the University of Melborune is leading a project on how to train dogs to sniff out Phylloxera. Sonja Needs, a viticulture and animal science researcher, says she could train any breed to be a sniffer dog and explained that it was a matter of taking dogs that were already trained in other services like explosives detection, and “flicking their switch.” She continued: “Once they are trained in detection, it’s a very simple thing to give them another scent and they just work.” Ms Needs said she was particularly interested in what stage the dogs could detect the life cycle of phylloxera. “I want to see at what depth, because phylloxera is on the roots inside the soil, so I want to see what depth if the dogs can pick them up at a metre below the surface,” she said. She is working with the Victorian Government on the research and hoped to have undertaken the training by the end of 2015. 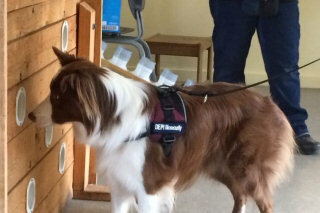 Picture of Ruby, the sniffer dog currently being trained, courtesy of abc.net. 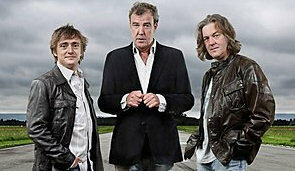 Though their fate as presenters of BBC’s smash hit has now been sealed, Jeremy Clarkson, Richard Hammond and James May are still due to deliver a series of live car shows which were formerly billed as ‘Top Gear Live’, but which have apparently now been stripped of all BBC branding and renameed “Clarkson, Hammond and May Live.” A UK national newspaper has obtained and published the backstage rider for the three presenters when they last took to the rode, which includes requests for Veuve Clicquot Champagne, Cloudy Bay Pinot Noir and Sauvignon Blanc and Chateau Leoube rosé. According to the report, if Chateau Leoube was unavailable, Clarkson requests a rosé that was “pale, dry and preferably from southern France.” Steak knives, a PlayStation 3, a Nespresso coffee machine and balsamic vinegar were also requested by the presenters. Pic courtesy BBC. Headed up by experienced wine professional and event organizer, Sophie Jump, a new service has just launched called ‘Planet Thirst’ that specialises in organising wine-centred events. Sophie says “Each event will be completely tailored for the client. With wine there is no limit to the type of experience we can organize whether it be an intimate do with friends or a large formal affair.” See planetthirst.co.uk.